I usually try to read at least the first two books of a series before I review it and decide whether I will continue reading or move on to something else. 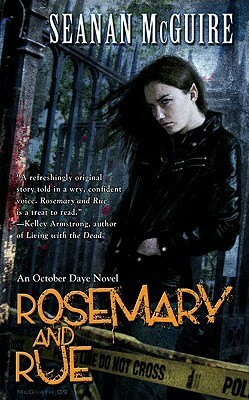 So today I will be reviewing the first two books of Seanan McGuire’s October Daye series: Rosemary and Rue and A Local Habitation. 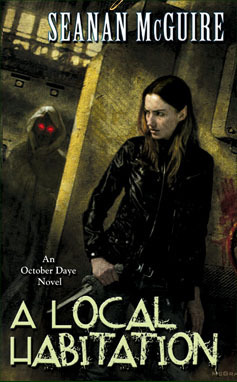 Seanan McGuire depicts a modern day San Francisco in which ordinary humans cohabit with all sorts of fae folk, both pureblood and half-blood, even though they are completely oblivious of the fact. Indeed, the fae don’t want humans to know that they are real and use glamor to appear human when they are out and about. Some of them feel pretty much at home in our world. They thrive and have successful businesses, legal and not so much in some cases. The main protagonist – October “Toby” Daye, is a half-blood Daoine Sidhe who is trying to fit in in the human world. She earns her living as a private detective, but also has to fulfill her duties as a Knight of the Shadow Hills. And she has a family – a husband and a daughter who have no idea that she isn’t human. This is how the first book starts, but this life is shattered in the very first chapter when the pureblood fae Toby was investigating turns her into a fish and leaves her in a pond to die. Only the spell eventually wears off and Toby becomes human (or half-human) again… eleven years later. She stayed the same, but life moved on without her. Her human family thinks she ran away and doesn’t want to have anything to do with her now. She has trouble adjusting to the new technological advances that happened in eleven years. But most importantly, she has trouble finding a meaning and a purpose for her life. I will let the readers discover the rest of the story of both books for themselves. What I want to talk about is why I put only three stars on this series so far. Let’s start with what I liked. I liked Toby and I can sympathize with her struggle to adjust to our modern world after eleven years of basically swimming in circles and thinking about fishy things. It is interesting to watch her reconnect with her old acquaintances and slowly get her motivation back. It is also interesting to see her developing as a character. I liked the world Ms. McGuire created and I am looking forward to discovering more of its facets. I especially liked the mention that the fae are mostly nocturnal, because their magic is most potent under the cover of the night, and that the sunlight weakens it. Or that the transitions at Dawn and Dusk are the moments when they are the most vulnerable. However, I was disappointed to discover that most of the supporting characters weren’t nearly memorable enough. In fact, it seemed like the majority of them were there just to act as background. So every time I saw a character that was more or less three-dimensional, I could bet that he or she would be either the villain, or the best friend, or the future love interest for the heroine. Also, for a private detective who is (supposedly) good at her job, Toby does a lot of flailing about in the dark instead of actual detective work. Her logic sometimes baffles me as well – in Rosemary and Rue, why did she refuse to go to her liege for help and went instead to the crime lord that had basically treated her as a slave for years? In A Local Habitation, when a killer is on the loose and offing anyone who wanders the building alone, Toby consistently let’s people wander off unsupervised and then wonders why they end up dead. And finally, I found the plot in both books slightly lacking in depth. In the first book Toby is cursed and needs to find the killer of her friend before the curse kills her. In the second book she is sent to check on her liege’s cousin only to discover that someone is killing off her subjects, so she sets to uncover who the killer is. Those are good premises, but they are not enough for a full length book. And the subplots are sadly lacking. All in all, I liked the world and I will probably stick around with the protagonist through the next installment of the story, but probably no further than that, unless book three is really good.